For the hard-core programmer, this pane is a listing of the raw CV data by CV number, with data in decimal format. You may change data by typing new numbers into the Values window. State shows the validity of the data, whether it was taken From file (the decoder information saved in the Roster), Edited, Read directly from the decoder, Stored to the decoder or if the status is Unknown. Note the scroll bar on the right side of the listings. You may scroll up or down to access all of the CV listings. You tried to read a CV value and get "Error 308, No Acknowledgement from Decoder", well the decoder may be locked. CV 15 and 16 deal with locking, if your manufacturer implements this feature (and manufacturers have slight differences as to how they implement it). If the decoder is locked, then you will not be able to read data from it or write to it. To unlock the decoder, you must enter a value into CV15 (the only CV that can be written when the decoder is locked), that is equal to the value that is currently in CV16. Now I hear you thinking "but I can't read CV16 to know what to put into CV15". Well, you'll have to try all possible values, which isn't that hard since it can only have 8 possible values 0 thru 7. After each write, try to read CV16. It's the fastest read since it can only have 8 possible values. If JMRI responds with the no-ack error, then try the next value. If it returns the value in CV16, you've unlocked the decoder and you're in. If you have unsuccessfully tried all the 8 possibilities, then check your layout connection and the loco's wheels for poor connections and try again. Now you say, "I've looked thru the list several times and CV 15 doesn't appear". That's on purpose, to minimize inadvertent locking by a Write All Sheets. 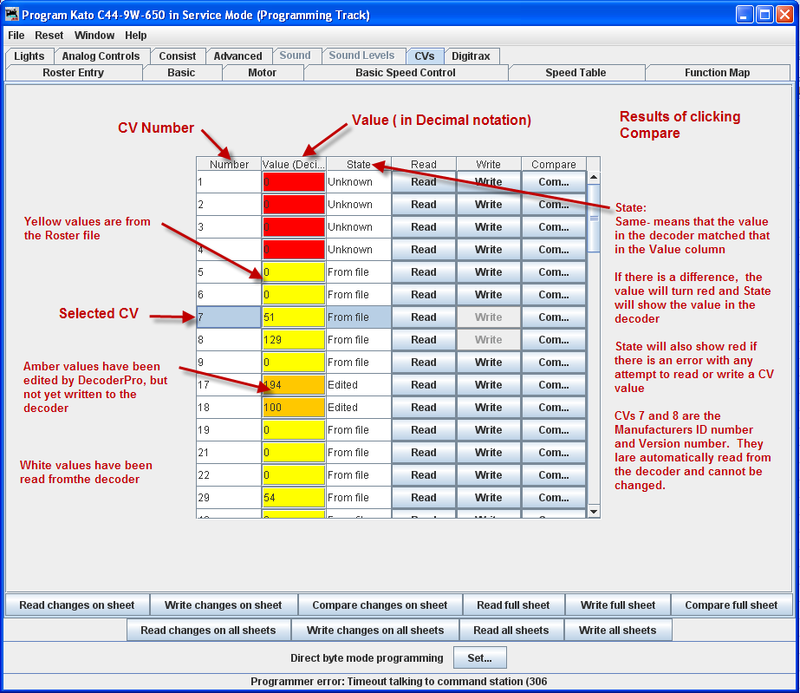 You will have to use the Single CV Programmer to write CV15. It can be found in the Tools menu on the Main Page, under Programmers. If you have more than one decoder in your locomotive, you probably have a decoder locking scheme implemented to be able to access each one individually for programming. You may Read or Write individual CVs using the buttons in their row. On this page, a Read sheet or Write sheet operation is the same as a Read all or Write all. Again, a reminder: you can only read CVs if your command station has that capability. One thing to keep in mind about the CV listing on this pane - anything you can do here you can do from one of the other panes in Decoder Pro, without having to know the CV number or how to compile the values to get the desired effect. This pane is meant for advanced users of DCC used to crunching the numbers themselves. Those new to DCC can safely ignore this panel without losing any capability at all.